There’s a new crispness to the air. We can all see that slight “hint” of the glorious colors about to take over our area. The football Pre-Season games are on. The kids are headed back to school. We’re all getting ready to “Jump Around” at Camp Randall! Ahhh, the season of Fall is upon us…..
What else do we know? We know winter is coming! Have you looked at your overhead garage door lately? Probably not. Besides, why would you? It’s worked great all summer. Even though we’d all like to ignore the upcoming season that comes after our glorious fall, it is best to be preemptive. 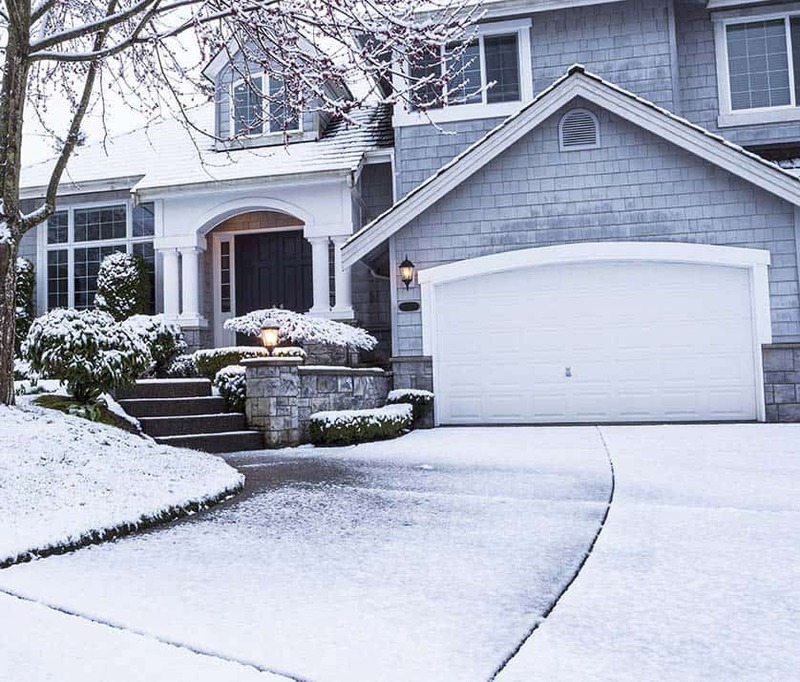 Your garage door is much more likely to fail due to lack of maintenance in the winter vs. the other seasons. Nothing is worse than having your car stuck in your garage. Except perhaps, having tickets to the Badger’s Football game and having your car stuck in the garage! NOTHING ruins a tailgate party more than not even being able to attend. Or perhaps you’re trying to head to your child’s school event, only to discover your car is now trapped in the garage. Broken Cables: when was the last time your garage door’s cables were checked? When we do our 20-Point Safety Inspection one of the first things we look for are rusty or frayed cables. A rusty or frayed cable is guaranteed to fail sooner rather than later. Worn or Bent (or missing) Rollers: If you have ever doubted the importance of garage door rollers, we would refer you to our blog from September of 2016 “Rollin’ with the Rollers. Rollers are the “wheels” that run in the vertical track, make the curve to horizontal track allowing the door to smoothly flow in the horizontal position. The horizontal position is also called the open position. Rollers that are failing will not run smoothly in the track. Rollers that do not run smoothly in the track can cause the door to stick or come off track. Garage Door Hinges (the pieces that hold the garage door sections together): are these hinges bent or have they been compromised? Many people have accidentally “bumped” or “hit” their overhead garage door. If this has ever happened to you, those hinges have most likely been strained. Bent or broken hinges can cause other hinges to follow suit. Once enough of those hinges bend or break, the door can actually fall apart! This can occur while your car is in the garage, while you’re backing out of the garage, or almost any other time. If the sections actually become separated from the rest of the door, what was originally a quick and inexpensive repair has morphed into an entire new door purchase. Bottom Weather Seal (also called Bottom Rubber): Have you noticed water under the garage door this spring and summer? There is a weather seal at the bottom of your garage door – on the bottom section. This is meant to keep water and snow out of your garage. If snow can seep under the garage door, the warmer temperature in the garage can cause some of that snow to melt. In the middle of the night, that snow then freezes. This freezing adheres the garage door to the cement. The next morning, when you try to open your garage door, the operator does not know the garage door is frozen. The operator can rip the operator reinforcement bracket out of the top section. It can also bend or bow that top section. That is why it is important to ensure that bottom weather seal is malleable and functioning properly. Lubrication: when was the last time your garage door was lubricated? This may seem like a simple fix. However, it is most often neglected. Stiff metal materials can still operate for a while. Once the temperatures drop below zero, those stiff materials can become immovable. Machinery in motion, with immobile parts, turns into broken machinery. The garage door is a perfect example of this. The Nuts and Bolts: are any of the nuts and bolts on your overhead garage door loose? Over time, the simple vibration of every day garage door use can cause the nuts, bolts and fasteners to become loose. These need to be inspected at least twice a year to ensure optimum performance. Operator Gears: is the gear assembly inside your operator still in good shape? Worn or frayed gears are gears giving you a “warning sign.” That could indicate the operator is about to fail. All too often our garage door and operator gives us plenty of warning signs. Maybe the door is a little louder than it once was. Perhaps it is a little slower to respond. There could be a rattle, or some other such noise. It is easy in the everyday business of life to allow these little signs to be overlooked. Take the guesswork out of these potential problems. Doing so could avoid frustration and excessive costs later. Schedule your Fall Tune-Up today!